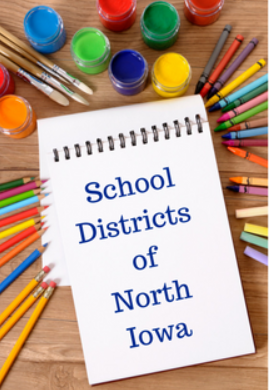 North Iowa is home to some of the best school districts in the state. These school districts are recognized for their academic excellence and wide variety of extracurricular opportunities. Learn more about each of these fantastic school districts by clicking on the links below and find your dream home within one of these amazing districts! The mission of Central Springs Community School District is “to cultivate a positive learning environment that engages and empowers all students”. This district has 2 campuses and serves students in Hanlontown, Manly, Nora Springs, Plymouth, and Rock Falls. Homes for Sale in Central Springs CSD. Clear Lake Community School District “provides engaging learning opportunities in an authentic, relevant, collaborative and safe environment to meet the varied educational needs of our students and prepare them for success”. The district operates 4 schools for students in Clear Lake. Homes for Sale in Clear Lake CSD. The mission of GHV Community Schools is “to prepare students for a successful future in a kind, caring, and compassionate way”. It serves the students in Garner and Ventura with 4 schools. Homes for Sale in Garner-Hayfield-Ventura CSD. Mason City Community School District “provides responsive learning opportunities grounded in collaboration, communication, critical thinking and creativity for all students”. The district operates 7 standard schools and 2 schools for students with special needs in Mason City. Homes for Sale in Mason City CSD. Newman Catholic School System is the largest private school district in the area. The district’s mission is “to educate individuals in the Catholic tradition by developing their spiritual, intellectual, and cultural lives”. It operates two schools within Mason City. Homes for Sale in Newman Catholic School System. Osage Community Schools strives to “sustain & enhance a caring community to produce enthusiasm for lifelong learning”. It serves the students in Mitchell, Orchard, and Osage through 3 schools located in Osage. Homes for Sale in Osage CSD. The Rudd-Rockford-Marble Rock CSD is “committed to providing an environment conducive to developing lifelong learners capable of being successful, responsible, contributing members of an ever-changing world”. There are 2 schools within Rockford that educate the students in Marble Rock, Rockford, and Rudd. Homes for Sale in Rudd-Rockford-Marble Rock CSD. The West Fork CSD is “dedicated to creating successful learners, citizens, and leaders”. This district serves students in Chapin, Dougherty, Meservey, Rockwell, Sheffield, Swaledale, and Thornton. It operates two campuses. Homes for Sale in West Fork CSD.